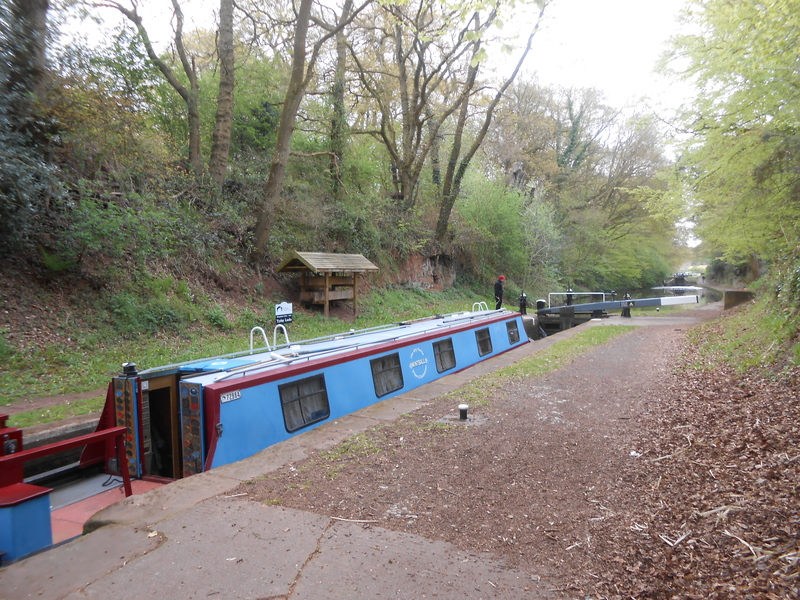 From Tom's Moorings to High Green Bridge No 14, a distance of 21 miles, 6½ flg and 6 locks. 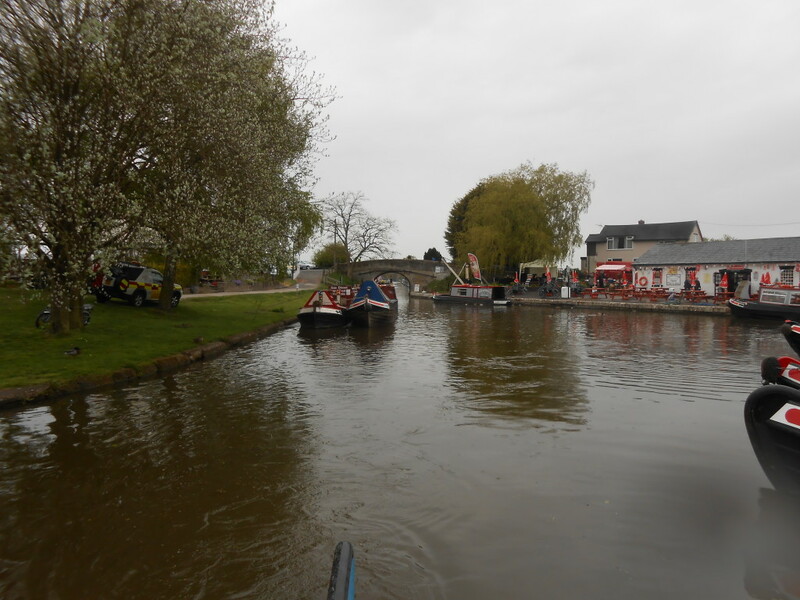 After a rather pleasant evening in Market Drayton, where we only actually went to two pubs (The King’s Arms and The Clive and Cofynne), and a rather later return to the boat than we’d planned, we made a not quite as early a start from the moorings. It had turned rather cool over night and the sky looked rather grey but not too ominous as we backed out of the moorings and headed south. 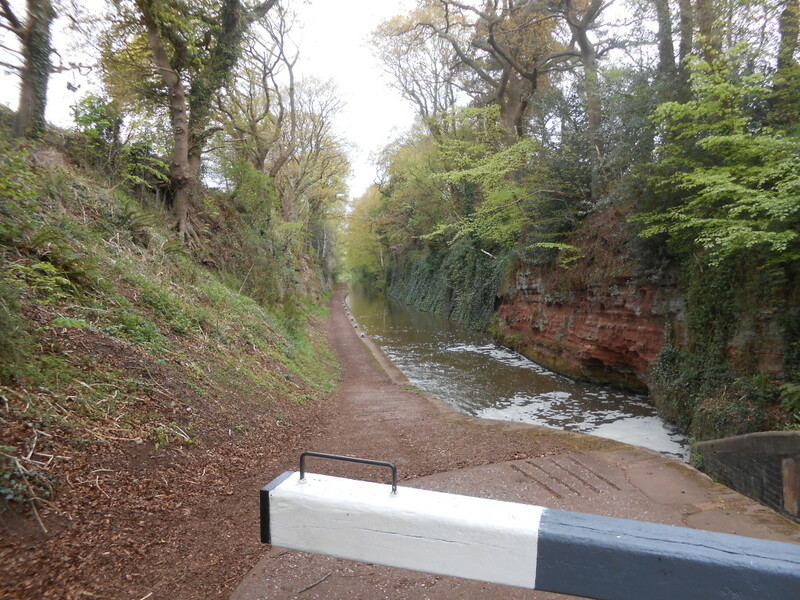 and for once the locks were actually with us, and apart from one boat coming down, which we passed in the middle of the flight, there was no-one else around – not even the usual collection of dog walkers. 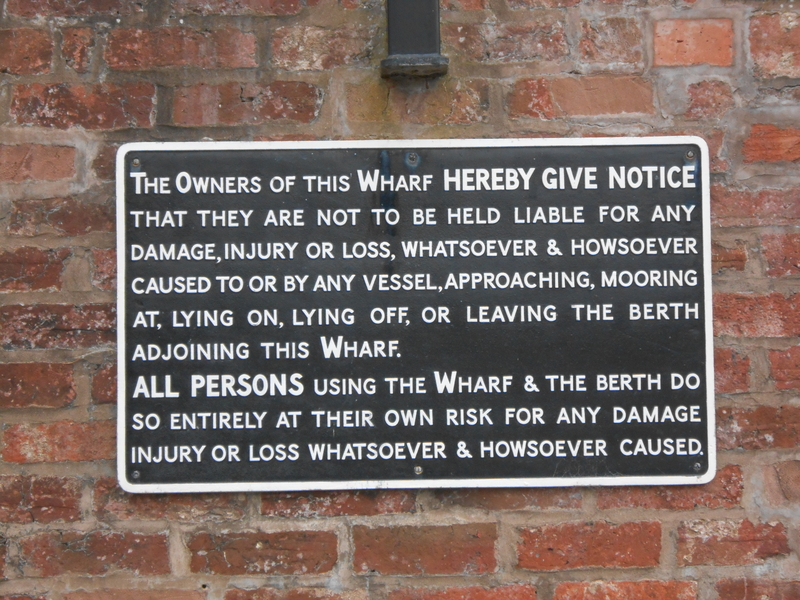 I’ve never noticed the disclaimer notice on the wharf building before and I’m not totally sure that its genuine – but I could well be wrong. 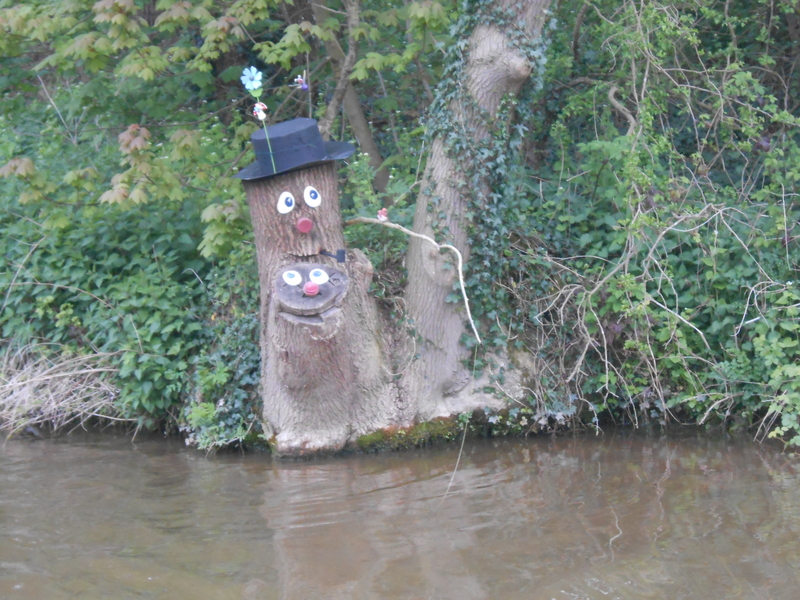 We bumped into a boat in Woodseaves Cutting, or rather they bumped into us – it was from Norbury Junction and we met them just on the bend after the bridge, but no harm was done : no coffee was spilt, no bacon buttie was lost. The lack of boats on the move continued and by the time we had reached Black Flat Bridge No 47 you could still have counted the number of moving boats with one hand. We decided to stop on the 48 moorings by the bridge and go and visit “The Haberdasher’s Arms” in Knighton. The problem is that the access path up to the main road at Newport Road Bridge No 45 has been fenced off so we ended up scrambling up the bank at Knighton Bridge No 46 and walking down a rather deeply rutted farm track to the road. The pub is a little way out of the village but well worth the trip – its a quirky little place and the landlord is very friendly (as is his dog) and the beer is very good. He told us the best way to go back was down another track and follow it round back to Black Flat bridge…. So if you want to visit the pub then stop on the 48 hour moorings, and take the bridge over the canal then follow the track down along its gentle right hand curve and you’ll find yourself on the Newport Road. Turn left (away from the factory) and head up to the crest of the hill and you’ll see the pub a couple of hundred yards away on the left hand side of the road- it has a post box outside and a campsite sign. BUT it only opens at 12:30 and does not do food. 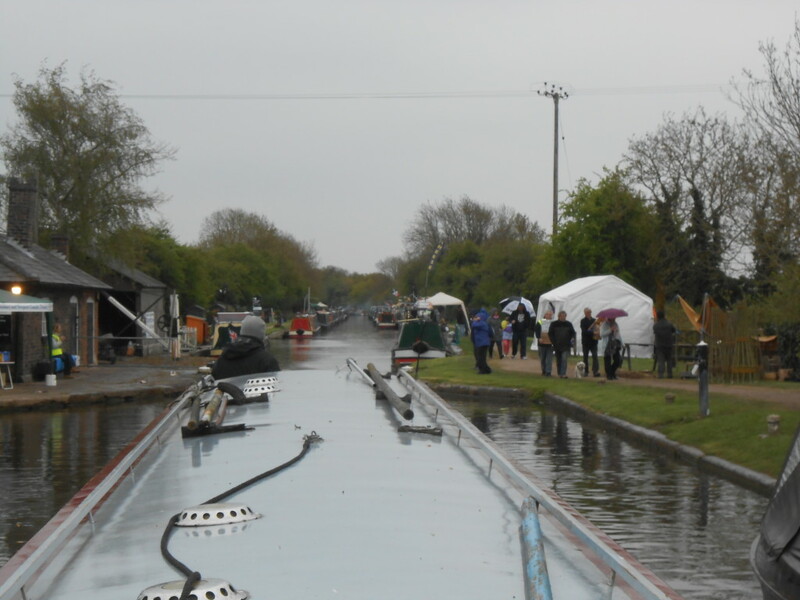 The weather, which had been getting slowly worse, settled down to a rather cold wind and annoying rain and by the time we arrived at Norbury Junction it was all getting a bit depressing and the rain had really settled in making it a far from pleasant Bank Holiday Saturday. There was a festival on at Norbury and the place was very busy with boats everywhere but due to the weather not as many people as you’d want, and I can’t imagine the ice cream boat was doing much trade at all. We put in 100 litres of fuel (they let us do it ourselves as their staff were quite busy) and then continued on our way past a lot more moored boats. I was expecting the moorings by Gnosall Bridge No 35 to be full given that it really wasn’t good boating weather and there are two pubs right on the canal but I guess the weather forecast had been bad enough to stop people from even getting their boats off their home moorings. Even on a good day you find that that a lot of boats stop for the night at about 5pm and so it really was unsurprising that we made it to Wheaton Aston Visitor Moorings without seeing another boat on the move, and these moorings like Gnosall’s were half empty. By now we were getting a bit cold and considered stopping for the night and just going into the Hartley Arms and having something to eat there but the lure of several different pubs and a curry was too much to resist and so we headed on into the sunset – not that you could see it. The only positive thing you could say was that the rain had pretty much stopped and it even felt a little warmer.